A few endangered species owe Google a thank you note. The search engine just gave $5 million (UK£3.1 million, AUD$4.77 million) to the World Wildlife Fund (WWF) for unmanned aircraft and other tech to help protect tigers, elephants and rhinos from poachers. The drones won't drop bombs on poachers (unfortunately), but rather keep a watchful eye in the sky to safeguard endangered species. The aerial surveillance will take pictures of poachers and track animals via smart radio tags. The money will also go to develop integrated specialized sensors and software that would help map where poachers might strike. "This is an absolutely critical grant from Google to World Wildlife Fund," Crawford Allan, a world wildlife trade expert who works with WWF, told TechRadar. "It gives us for the first time an opportunity to change the game rapidly against the poaching of our most precious wildlife. "With this $5 million grant over 3 years, we will be spending the money on developing a cutting edge, integrated technological solution to deterring and detecting poachers in Asia and Africa." 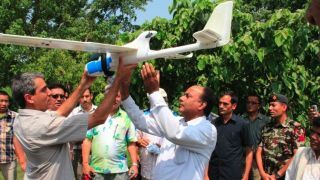 The organization already flies unmanned aerial vehicles over routes in Nepal to help monitor tigers and rhinos. The new funds will allow the WWF to expand operations into Africa and Asia and test new technology in those regions. But the aircraft is only part of a larger effort to curb poaching. The automatons will back up park rangers already trying to run down wildlife criminals. Rhinos in particular are in danger - poaching of the animals has risen sharply in the last year. In 2007, 13 rhinos were illegally killed in South Africa, but this year that number has climbed to 488, according to wildlife monitoring network Traffic. WWF predicts rhinos will become extinct within 10 years if nothing is done. The search giant gave WWF the grant as apart of its new Global Impact Awards program. The awards give support to organizations that use "technology and innovative approaches to tackle some of the world's toughest human challenges," according to the Google Giving page. Google gave $23 million (UK£14.2 million, AUD$22 million) in the first round of donations to seven organizations such as charity: water, Give Directly and Equal Opportunity Schools.